The industry-standard reference book for handbells and handchimes, now available in its ninthh edition. Handbell/handchime notation, difficulty levels, and solo and ensemble notation are covered in this three-part, thirty-two-page book. Revised 2016. 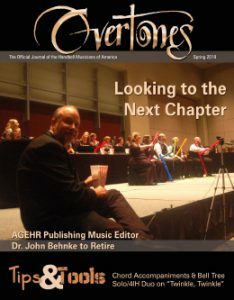 Available from most handbell retailers or directly from Lorenz Publishing, distributor of AGEHR Music Publications. The following system should be used only as a guide. Tempo, number of ringers, handbell assignments, etc. will have a dramatic effect on the difficulty of any music selected. 1. Key changes and accidentals ARE handbell and handchime changes. 2. Tempois VERY IMPORTANT in assigning level of difficulty. 3. Handchimes should be considered as a special category. However, when used with handbells within the same piece, a handchime should be considered a “handbell” change. 4. When a piece contains a six-measure (or less) phrase of technical difficulty above the specific level assigned, the piece should not be raised to the next level of difficulty. That phrase should be treated as a “special practice” spot for learning. 5. Shelley, four-in-hand, grace notes, and sharing of handbells are directors’ decisions based on the size of the group, number of handbells, and dexterity of the ringers. 6. 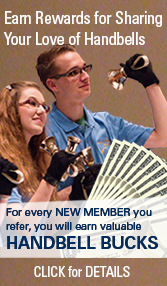 Difficulty levels are assigned for “traditional size” handbell choirs, i,e., 11-13 ringers. All levels are cumulative. 7. Each difficulty level is described by 8 criteria. They should be used to determine the level of the work before selection. 8. On multiple octave publications different levels may be assigned to specific octave designations. Example: a 3-5 octave publication may have the following designations: 3 octave – L3, and 4-5 octave – L4. 9. A plus or minus may be added to any level designation when appropriate.